KCMO, KCK among 15 communities taking part in $6 million National Science Foundation/White House initiative to create an “app store” of smart applications for cities. 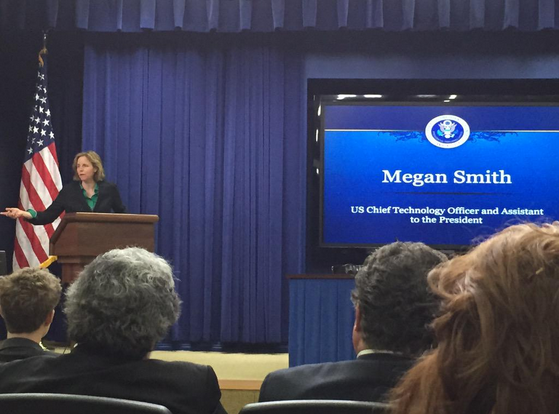 U.S. Chief Technology Officer Megan Smith speaking at today’s White House Smart Cities Forum (Photo via @Thingstitute). Today, the cities of Kansas City, Kansas, and Kansas City, Missouri, were recognized on Capitol Hill as participants in a $6 million, three-year grant from the National Science Foundation to US Ignite through the White House’s new “Smart Cities Initiative.” The purpose of the grant is to form a national network of communities using ultra-high speed broadband to develop technology applications for the benefit of citizens. News of the grant came today at the White House Smart Cities Forum in Washington, D.C. The project, titled the Sustainable Ecosystem of Smart Applications (SESA), is part of the Obama Administration’s larger push toward enabling US cities to develop their own civic tech programs. According to today’s White House fact sheet, the Smart Cities Initiative will invest over $160 million in research and leverage more than 25 new technology collaborations that will help local communities tackle challenges such as battling traffic congestion, reducing crime, enhancing economic growth, managing climate change, and improving the delivery of city services. The SESA grant focuses on cities, like Kansas City, that have high-speed broadband networks in place. SESA is being coordinated through US Ignite, a national organization that fosters the creation of next-generation Internet applications that benefit communities. In addition to KCMO and KCK, other participating SESA communities include Burlington, VT; Chattanooga, TN; Cleveland, OH; Flint, MI; Madison, WI; the North Carolina Next Generation Network (NCNGN); Richardson, TX; Utah Wasatch Front cities including Salt Lake City and Provo, UT; Lafayette, LA; Urbana-Champaign, IL; and Austin, TX. In Kansas City, KC Digital Drive will serve as the focal point for executing the grant. A nonprofit created to make Kansas City a digital leader to increase economic prosperity and improve people’s quality of life through technology, KC Digital Drive has served as the liaison for US Ignite efforts in Kansas City, including the Gigabit Explorer Challenge hackathon in 2013. As part of project, Kansas City will contribute at least two entries to a “smart city app store” containing open, interconnected technology applications addressing social problems in areas such as transportation, clean energy, public safety, education, workforce technology, health IT, and advanced manufacturing. KC will receive help from US Ignite in creating the conditions necessary for innovation. These include establishing a fiber-enabled cloud computing back end infrastructure, sharing best practices for collaboration across local and national boundaries, and providing technical support. In Kansas City, KC Digital Drive intends to work with partners, including the city governments of KCMO and KCK, to help our locally built applications enter the market and receive adoption in other cities. Details are still emerging as to how the SESA project will roll out in Kansas City, but several homegrown applications in the KC Digital Drive network have already been identified as possible contenders for support through the project. One, a pilot out of the University of Kansas Medical Center, uses gigabit Internet to assist caregivers of patients with Alzheimer’s. The other, a project from the University of Missouri’s Center for Eldercare and Rehabilitation Technology, uses Internet and sensor technology to help senior citizens age comfortably at home. For more information on the project, contact Jason Harper, KC Digital Drive communications director.